Threshold Alerts is one of my favourite new features in SSMC and allows alerts to be configured based on defined metrics. These alerts can be defined against logical components such as virtual volumes or physical components such as disks. An alert is triggered when a defined threshold is exceeded, for example you may choose to alert when ports are over 75% busy. Threshold Alerts are integrated with the service processer and will trigger an e-mail being sent. 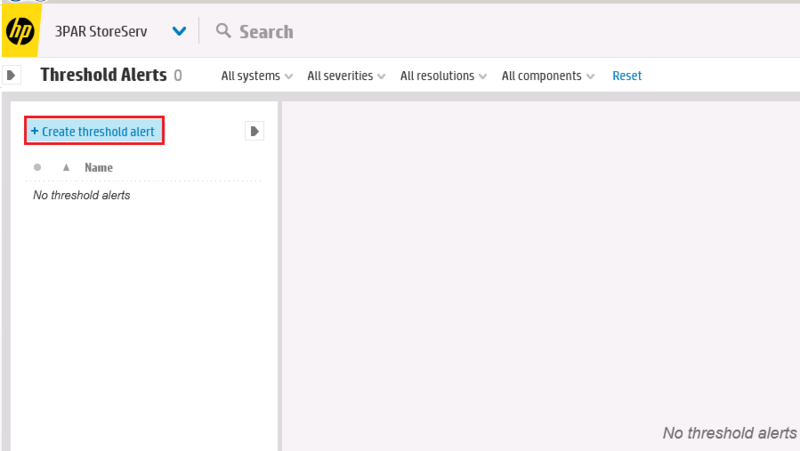 You will see triggered alerts within SSMC from the dashboard view, the below screenshot shows 2 systems with no active alerts if an alert was triggered the donut would turn yellow. To make setting up Threshold Alerts easier they can be configured through pre-defined templates. Different templates exist for different components and each one can be customised as required. To use threshold alerts the system must be licenced for System Reporter. 3 In the general section select the system and choose the alert template. 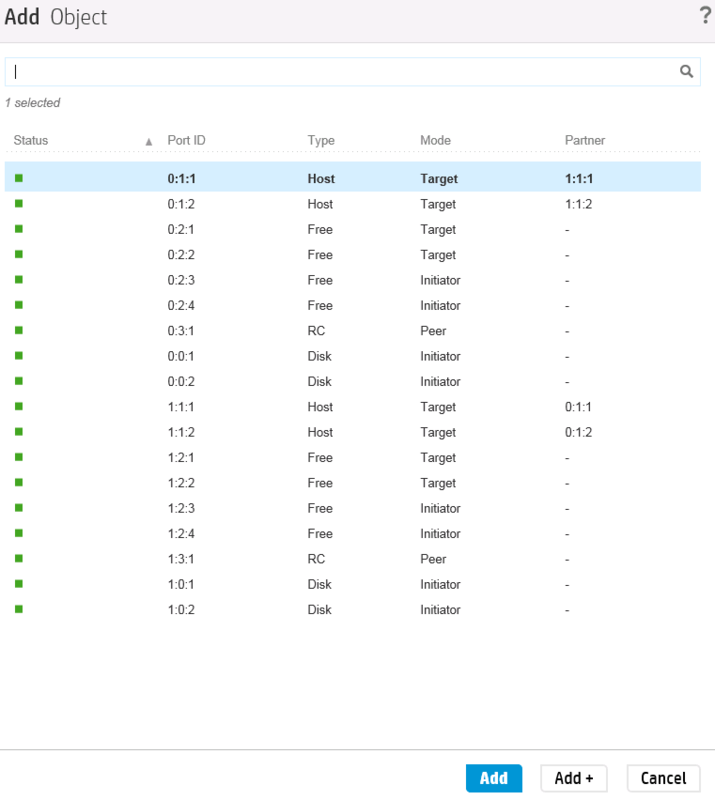 Below shows an example of the alerts types you can work with they include ports, disks, nodes plus logical objects such as VV’s and priority optimization. You will also need to choose the alerting level resolution which is how often the data will be sampled to see if the alert has been triggered. Remember choosing a higher resolution may result in more alerts being generated when there are spikes, to ensure the alert condition is sustained choose a longer sample time. Choose the severity you would like to associate with the alert you are configuring. 4 In the objects section you can filter against which objects alerts are generated. If for example you only want to monitor certain ports or VV’s this is where you can narrow them down by selecting filter by objects radio button and then clicking add objects button. 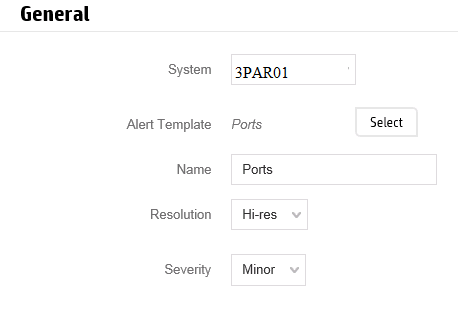 The screenshot below show an example of objects you can filter on when creating a port alert. 5 Finally chose the metric you wish to measure on. The following screenshot is again for the port objects, you can chose to measure on metrics such as % busy, bandwidth and service time. Metrics can be combined so that multiple conditions must be met. 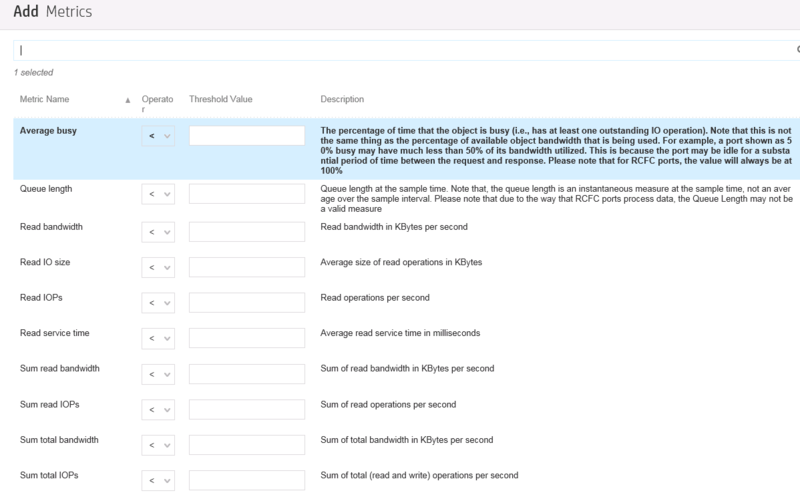 For example the following alert will only trigger if service time is over 40ms and IOPs are greater than 1000. 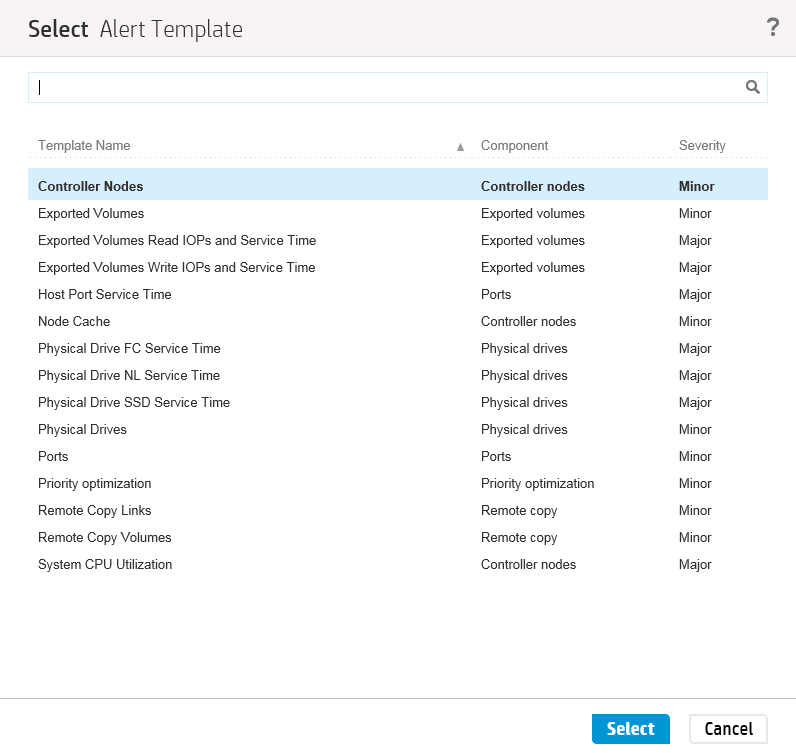 Up to 64 alerts can be configured and it’s worth noting the alert will be centrally monitored by HP and could trigger support cases. Alerts can also be configured via the CLI using the command createsralertcrit, more on this another time. SSMC 2.1 – What’s new? Next Post Have your say – SSMC What’s hot what’s not? Found it. 2.1 was released a few days ago. I’m running 3.1.3 and the latest SMCC but don’t have the threshold alerting feature unfortunately. I’m wondering if it is only available when running 3.2.1? 3.1.3 should be supported, you definitely running SSMC 2.1? How can I modify the alerts on SSMC with createsralertcrit? Hi so I set up some threshold alerts and I added some email addresses under settings. You know of anywhere I can debug, see a log of emails being sent by the SSMC ? Well actually I think the problem is that the SSMC doesn’t pick up on the alerts. I reinstalled the SSMC and it immediately picked up on a threshold alert that I set and had generated an alert. But when I then create a new one that also created an alert the SSMC never picked up on it. It did show up on the CLI and in the IMC. And I assume if the ssmc doesn’t see the alert it won’t send a mail. So the issue is in the ssmc not polling the 3par. Oddly enough I see the same issue on 3 different ssmc installs.